The cave is the major resurgence for the area and a large diameter pipe removes water supplying Santander. Information gleaned from the Dirección General de Obras Hidráulicas y Ciclo Integral del Agua in 2005 shows an average water flow from the resurgence over the previous 20 or so years of 951 litres per second. (For comparison, the resurgence at Los Boyones (fed by catchments above Cueva Vallina, Matienzo and Riaño) emits 650 litres per second on average. An optical brightener test from the end of the Sumidero de Cobadal (1930) over Easter 2006 gave a positive result after 5 - 7 days during medium to medium-high flow. During the 6 or so visits over a fortnight the water levels were slow to react after some heavy rain, and even then only rose by approx. 7cm. Los Boyones rose by 120cm much more rapidly. 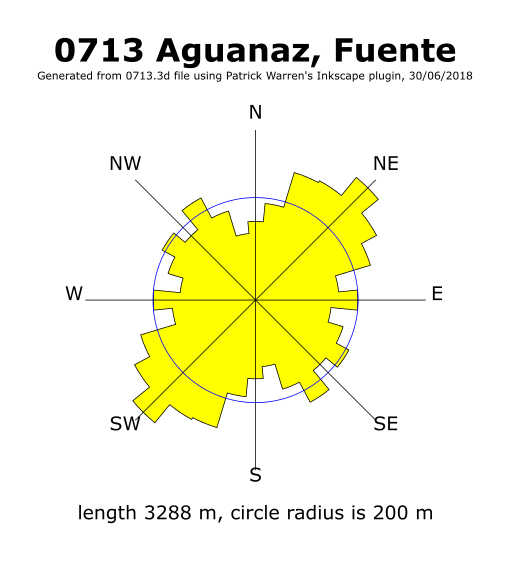 The details of the test are found here. There is a possiblity that water from the Sumidero might drain to Torca La Vaca during low to normal flow, only passing over into Fuente Aguanaz during high stage. Some suggestions regarding water sources for Aguanaz are detailed here. In 2009 these possibilities were outdated when an inlet, apparently from La Gatuna, was explored. An optical brightener trace over March / April 2016 from the Duck Pond Sink (site 1976) near Barrio de Arriba gave a positive result at Aguanaz after 4 - 7 days. An optical brightener trace over April / May 2017 from El Cubillón (site 2538) gave a positive result at Aguanaz after 6 - 8 days. More details are shown here. A summary of all water traces with a map can be found on the Water Tracing Investigations page. 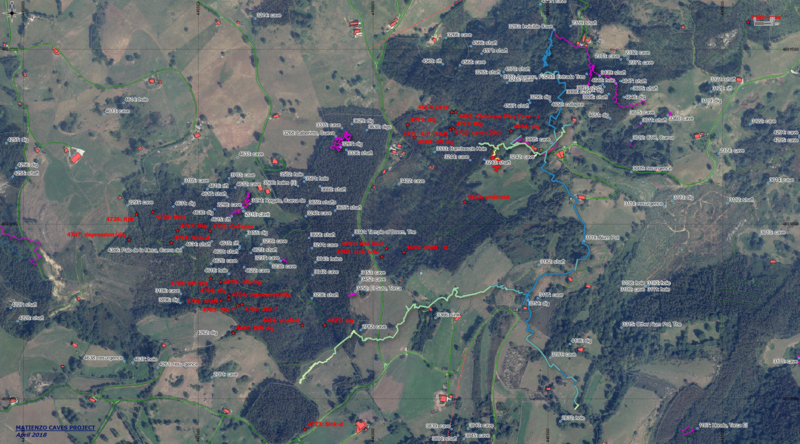 - the 2016 Hoyón (site 567) trace which was successfully detected at Comediante - site 0040. - OBA was put into a stream in a Moncobe site being explored by the GE Pistruellos. The water was traced to La Riega. The resurgence can emit large quantities of water, flooding the low lying ground around Entrambasaguas and beyond. One effect of the Whit 2008 flood was to jam leaves around the door of the new pumping station, which is probably 7m above the normal water level. A smaller flood in October of the same year was shown on national TVE news. (Photos here). After a very dry summer, the Diario Montañés (22/8/2012) reported a flow of 0.1 cumecs. The resurgence area has an outdoor interpretation centre with 4 boards explaining about water and the environment, now vandalised. Further boards are in the old pump houses. The water level at the bottom entrance is at about 55m altitude and is reached by walking down concrete steps. Sixty metres up behind this - reached by a rising track setting off on the right of the car park - is a hole below a scar in a depression which is where the pipe reaches to abstract the water. Upstream from here is the middle cave. The entrance for the top cave is another 70m south and starts as a route between boulders. The grid reference for this entrance was altered in 2008 and is that shown in the heading. Just below the top of the rope climb, a hole was opened up in 2009, heading west. This turned out to be an alternative way down to the stream rather than any high level development. A sketch shows the sumps in the cave (August 2018). The entrance constriction was removed in August 2018, making the exit for tired divers must less wearisome. A further consolidation of the route occurred on Christmas Day 2018, with more gardening at the pitch head and new bolts placed to make a "comfortable" ladder pitch. The site is mainly swimming. Half way through, the water can be left and there is an inlet on the western side. This was pushed and resurveyed in the summer, 2009. Beyond the aven the inlet stream continues through an choke to two short ducks and a continuing stream passage which lowers to a flat out crawl with a slight draught. Before this, a climb out enters a large chamber / passage which may continue south beyond an unexplored pitch down. The area was reinvestigated and pushed on one trip at Easter 2010. "Had a good look round in the boulder choke. Could not find the main way on but found plenty of high level passage with deep holes in the floor. Possible ways on? About 250m unsurveyed?" About 150m were surveyed to 40m above the stream where the high level passage lies. See photos taken on this trip. An inlet on the east was also explored, summer 2009, for 70m and ending at a too tight rift with no draught. A aven was free climbed 9m after a tight squeeze up to where it continued up out of sight. In 2014, the 2009/10 extensions were re-examined - in the chamber with 2 avens, the one at the top of the slope looked the better climbing prospect. The streamway up to sump 1 was re-explored in the summer 2013 and all side passages at water level were found to be undercuts or blind air bells. The line was also repaired. In August 2014, in low water conditions, a "lovely swim to the sump and back" was aided by thick wetsuits, fins and a bouyant tackle bag. The southern sump was dived at Whit 1995 and was passed in 5 to 6m visibility, after 35m, at a maximum 5m depth to a large sump pool on the other side. De- kitting occurs on a mud and boulder bank on the left. The main stream continuation was then fully explored for 500m during the summer of that year and consisted of swimming and wading until the passage climbs several cascades to meet the unexpected sump 2. At Easter 2017, beyond sump 1 and on the true left of the passage just north of a 0.5m waterfall, the Sarah Jean Inlet was explored by Jim Lister and Dan Hibberts for 770m heading west-southwest, passing through a small sump and finishing at an over-tight hole up between boulders into larger passage. (Batch 0713-17-01). Links to video of this exploration are shown below. Sarah Jean was extended by Jim Lister and Mark Smith in April 2018 when the way on was found at stream level below the choke. Here, a flat-out crawl with 4" airspace leads to walking passage in good rock. The streamway ends in a large sump. (Batch 18-01, length 73m). Further exploration by Jim Lister passed sump 3B (which varies between 3 and 15m in length) to walking passage (with a possible tight slot in the wall with a good echo) and sump 4B (which had disappeared in drier conditions) with more walking passage beyond to sump 5B, dived for a short distance. (Batches 18-02 and 18-03, lengths 17m and 73m). A video of this extension is linked below. Summer 2018 explorations Diving continued as Jim Lister and Mark Smith, not finding their way through the "final" sump 5B, explored passage to the right. A climb up leads to rift passage that intersects an aven (12-15m or "at least 20m" high) with a shower of water coming down. The aven rock is a very light grey colour with many fossils - very different from the smooth brown walls on the way leading to it. A climb to the left of the aven closes in. A climb on the right, under an arch, leads two-thirds of the way up the shaft. Carrying on under the arch, the passage continues as a rift to a stal, where exploration stopped at a "reasonably small rift but still has a stream". This extension was surveyed as batch 18-04, length 172m). Aerial panoramas and video fly-overs were taken over the 2018 end of Sarah Jean Inlet. These can be found on the Aerial Panoramic Photos and Videos page - 5 photos under the SanAntonio-south heading and 2 videos with the Fuente Aguanaz (SJ) heading. Back in the main passage, the 25m long sump 2 was passed to approximately 300m of passage, ending at a boulder choke with a slight draught and one potential digging site. An extremely small, sharp sump continues at stream level. This was entered at Easter 2001 to an airbell to the right of the sump and then pushed in the summer to a "quite tight close down", 5m from the previous limit. Running water could be heard from the rockfall above. At Easter 2006, this seems to have been dived again. There is a climb above sump 2 which needs attacking. 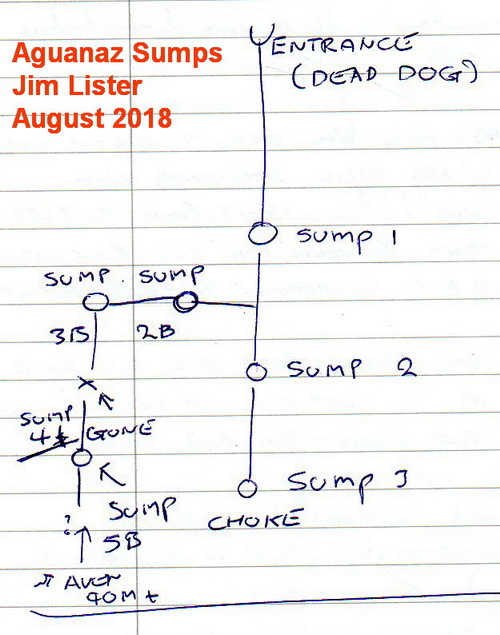 The descriptions of the sump before the choke, the choke and the final upstream sump was confirmed by Jim Lister in August 2017. At Easter 2018, Jim and Mark Smith pushed the final sump, knocking off rock pendants to access an air surface with a left hand passage leading off for 3m to a sharp right hand bend where the sound of running water could be heard in the distance. In the summer 2018, 5m progress was made after a duck under the left hand wall. Several rocks were capped to gain another 4m but the choke continued. This may be further pushed when water levels are lower to allow capping. "The inlet on the left" after the second sump was pushed at Easter 2001. The passage continues tight through a few short climbs. A small chamber leads to a larger one with mud and boulder walls. A stream enters through the ceiling. The place smells of "outside". This also appears to have been entered at Easter 2018 where it was followed for 90m to a rift which was climbed following the water to a tight window. A chamber with a good echo could be seen beyond but capping is necessary to gain access. This was capped in August 2018 to enter a "modest chamber" and a 3m climb up to a crawl and a slightly larger chamber with a 5-6m climb to a passage with a small stream. (As this was being climbed, a handhold gave way and Mark Smith fell face down onto a rock. The chamber was named Rudolf Chamber and the passageway out, Galería de Vampire. The Eastern Inlet was later surveyed as batch 18-06, length 81m. Compared to Torca La Vaca, about 1.5km to the east, Fuente Aguanaz is a disappointment. There would appear to be no reason why this cave should not have (a number of) high levels. Perhaps the western extensions in 2009 have started to reveal these. More climbing up from the stream level and investigating avens is required. There was apparently no account of the upstream passage from the middle entrance being explored until the summer 2013. Some photos were taken near the downstream end; more photos have now been taken and the passage surveyed. The upstream sump was inspected at the end of July 2014, but no dive was made. A small hole on the east bank of the resurgence is the entrance to Invisible Cave, site 3283, a stream passage apparently not connected to Fuente Aguanaz but probably connected in the past as an inlet, before Fuente Aguanaz entrance cut back. A small, 4m long cave in a gully above the Aguanaz cavers' entrance was maypoled into in summer, 2009. A diagram of the hydrology of the San Antonio - Hornedo - Cobadal area drawn after Easter 2011 can be found here. Over three days in July 2011, the supposed upstream course of Fuente Aguanaz (or, at least, part of it) was dowsed. The furthest point reached was a small sink close to the entrance of the Sumidero de Cobadal. A number of inlets and sinks were also highlighted. See the links below.